The Mont Ventoux - at 1909m, 6300 feet - is perched high above Provence, and is also one of the most famous summit in Europe. Also called « the Giant of Provence », its name means literrally in french “windy mountain”. From the summit, its 360 degree panorama, made clear and far-reaching by the howling Mistral wind, is nothing short of awe-inspiring : an exceptional view of the various and famous landscapes of the Luberon, as well as the Drome and the Alps. Its base laden with Mediterranean vegetation to its summit is sprinkled with Alpine flowers. It has been classified by the UNESCO "Biospère Reserve" thanks to the diversity of its fauna and flora. The vegetation on Mont Ventoux is extremely diverse: from the Mediterranean garrigue of the base, to the Alpine and even Arctic flowers around the summit! For 15 years, there has been talk of turning the Ventoux into a “regional nature park”, much like its neighbours in the Luberon and in the Camargue. It is indeed a mythical mountain for bikers, but also ideal for walkers. The Mont Ventoux is a MUST for every cyclists, made famous by the epic climb on the « Tour de France ». Mont Ventoux climb is THE challenge to achieve for any cyclists - both amateur and professional: an unforgettable and unique climb ! Swept by the Mistral, you cycle on a steep road that climbs up to the wind-blasted summit. It is a hard & long cycling climb : a physical challenge along with a mental one ! Mont Ventoux is centrally located in Provence and overlooks one of the most beautiful roads of the area. Looking to the south all the way to the Med Sea on the famous Côtes du Rhone vine-covered plains and the cherry orchards of the Vaucluse. Looking to the north, the entire chain of the French Alps peaks, including Mont Blanc. And finally to the East, the Sault platau and its lavender fields blanketing the hills. A genuine and remoted Provence, far from the tourist radar ! Mont Ventoux became a legend with the Tour de France. The Tour de France itinerary changes every year, and counting Ventoux’s reappearance in the 2016 Tour, the mountain has been used at least 15 times during the Tour de France history. Not only being a « must » for all bikers, it is considered as the “Everest” of cyclists. Often considered as one of the hardest climb in France, Mont Ventoux is attracting amateur cyclists from all over the world. 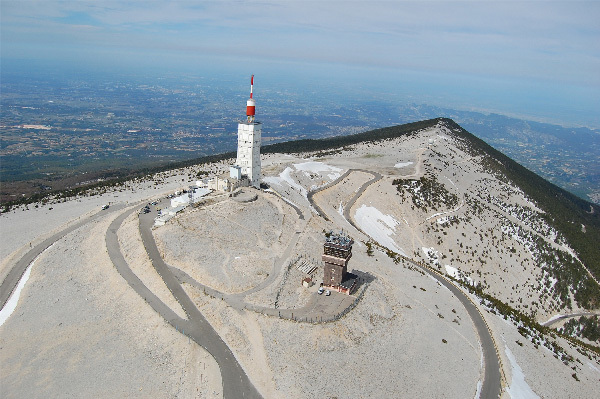 The summit of the Mont Ventoux is a treeless lunar landscape, with spectacular views from the summit. 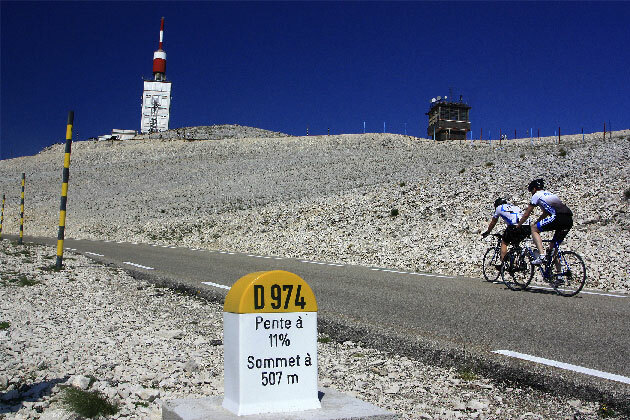 Summiting Mont Ventoux will be indeed one of your best cycling memories! 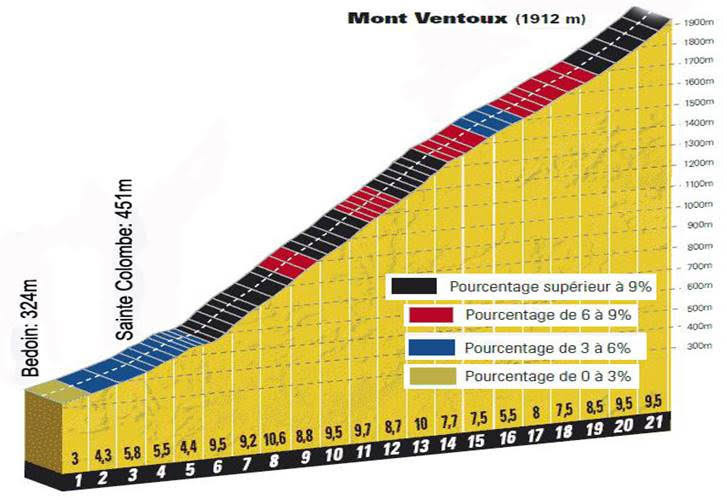 The classic way up to the Mont Ventoux is the ascent from Bedoin : just like the Tour de France! From Bedoin, there are 2km of moderate climbing to reach the hairpin bend of St. Estève, followed by a grueling 10km climb through the forest at a 10% gradient to reach Chalet Reynard. Once at the chalet, acting as a ski resort in the winter, the road becomes slightly less steep - around 7% - but among the bare rock near the summit the winds can be howling for the last 6km to reach the summit. The record – from the town of Bédoin to the summit – was set by the Spaniard Iban Mayo at just over 55 minutes. Would you like to give it a shot? The descent will be then one of the most exhilarating ones of your cycling life ! The Provençal climate is characterized by the bright and ever-present Provençal sun, as well as dry summers. The winds and rains, though sporadic, can be quite strong. Winter is most often mild and sunny, with incredibly clear skies. A great season for walking and cycling, and admiring incredible lighting: Alpilles, Dentelles de Montmirail, Luberon and the Côte d’Azur. Autumn & Spring, with their summer-like days, can sometimes bring with them more abundant rains. Magnificent seasons to explore Provence by bike or by foot. Summer is very hot and dry, with occasional thunderstorms that cool the air. Walking is great in the interior of Provence, above 1000 m (3300 ft) in altitude to avoid the heat: Cevennes, Alpes de Haute Provence, back country of Nice, Mercantour nature park… Cycle through all of Provence in the mornings and late afternoons, coasting with the gentle breeze; get a good sieste in the shade of the plane trees during the hottest part of the day. 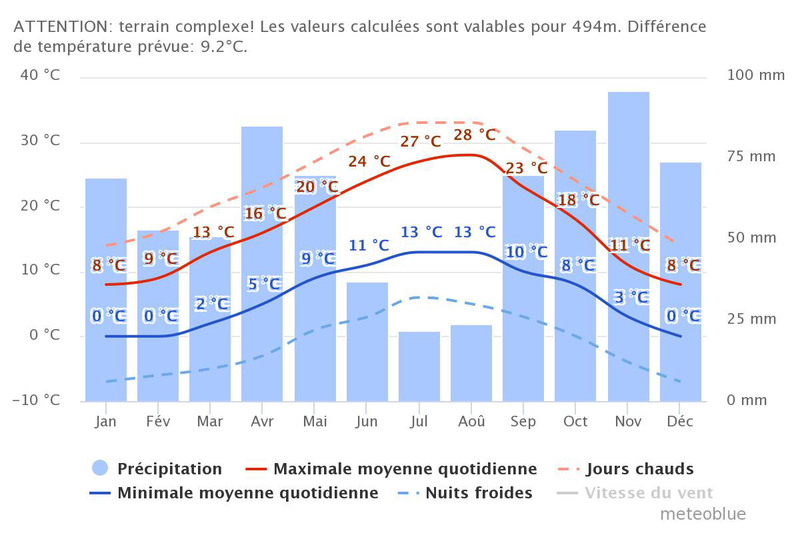 Mont Ventoux has its own climate. You can have at the summit a searing heat – because of altitude – but also a strong storm with terrible wind - it is windy about 2days out of 3 - that has reached, in the past, over 300 km/h. And in between : any kind of weather .. However, the site benefits of the Mediterranean climate most of the year, with 300 days of sunny days and a mild temperature from 15 to 25 degrees. Always check the weather forecast before climbing the Mont Ventoux. The wind can blow violently and destabilize the biker. In that case, it’s a must to have bike gloves, glasses and a wood hat, especially in spring and automn. However, the site is known for its nice & mild climate from 15 to 25 degrees, that enables cyclists to climb the summit 8 months a year! The Mistral is a strong, cold and usually dry regional wind in France, coming from the north or northwest, which accelerates when it passes through the valleys of the Rhone and the Durance Rivers to the coast of the Mediterranean around the Camargue region. In the south of France the name comes from the Provençal word « Mistrau ». The mistral is usually accompanied by clear and fresh weather, and it plays an important role in creating the climate of Provence. It cools the hot summers and produces a brisk chill in the winter. It is always accompanied by the sun, an intense blue sky, and a spectacular visibility. It can reach speeds of more than 90 kilometers an hour, particularly in the Rhone Valley. The mistral is a regional wind, which usually blows during the winter and spring, though it occurs all year round (and feared in the summer for forest fires). It sometimes lasts only one or two days, frequently lasts several days, and sometimes lasts more than a week. Locals often said that when it starts, it blows in multiples of 3 days. The mistral comes along with an anticyclone, or area of high pressure in the Atlantic between Spain and the southeast of France, and an area of low pressure around the Gulf of Genoa. There are beautiful hiking trails that criss-cross the Mont Ventoux, from the base to the very summit. Its slopes are covered with dozens of exceptional walking trails, for all levels of fitness. The mountain offers a great diversity of flora and fauna: a playground for mountain goats.